Press the Reload/Refresh button on your browser to make sure you are seeing the latest edition. Click on the cover image to read the paper online. Hardcopy papers hit news stands in St. Mary's County every Thursday morning. The online edition will appear the same day. Hardcopy papers hit news stands in Calvert County every Thursday morning. The online edition will appear the same day. The St. Mary's County Times, published weekly, is the only locally-owned and operated newspaper that serves St. Mary's County, Maryland. Our first edition was published on Thursday, November 02, 2006. 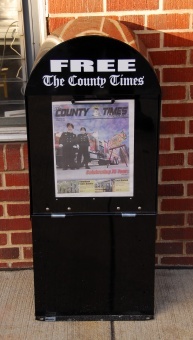 The Calvert County Times (formerly the Calvert Gazette) is also published weekly and serves all of Calvert County. We publish on Thursdays. You can find the newspapers on newsstands, and in paper boxes, throughout Calvert and St. Mary's Counties. Papers are currently free on the news stands or you can subscribe to receive the paper via U.S. Postal mail for a small annual fee. Our advertisers make it possible to provide the paper at no cover charge to the community. You can also view the papers online using our Adobe Flash-based reader (click on the respective cover image above). Copies for the past several years are also available in Adobe Acrobat PDF format in our online archive [ St. Mary's County Times Archive | Calvert County Times Archive]. A complete archive can be found online at both Scribd and Issuu. You can also read either paper on your Android or Apple device by downloading either the Issuu app or the Scribd app from either the Google Play Store or iTunes. For the latest, breaking news, please visit Southern Maryland Online's Headline News. If you have a news tip, an idea for a story, a community calendar submission, would like to place a classified ad, or would like information about display advertising in the paper, please contact Southern Maryland Publishing Company.